Curious neighbors noticed recently that a large number of well-dressed women have been taking the streetcar to the end of the line at 54th Street and South Central Avenue while still others are arriving in automobiles. Upon investigation, Patrolmen Walsh and Murphy discovered that the women are gambling on horse races at a bookie joint set up next to the Ascot Park billiard parlor in a vacant lot surrounded by a high board fence. Owners J.W. Carr and W.J. 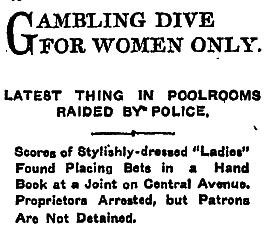 Murphy restricted the clientele to women, so police had a difficult time obtaining evidence, but finally officers raided the place and found 50 stylishly dressed women playing the ponies.